It's been a long time since I first saw the wild horses of Nevada. From the moment I did, I knew I had to write about them -- especially the colorful and family-bound horses of the Calico Mountains. When the Phantom Stallion galloped into my imagination, his homeland became the Calico Mountain range. For years, these real horses lived as they were meant to live. Now, they've been harassed with helicopters, exposed to disease, tormented with branding, castration and watching their families die and be taken away. These Calico horses have been through so much and yet, when I was out at PV yesterday, they are still alert and interested, not shattered. The black filly tagged 0950 is elegant and moves like a dressage horse as she follows me along the fence. Shell Flower is friskier than I've ever seen her. The little lop-eared filly known to some as Tassel (that's her, below) has become something of a pet. She nudges other horses out of the way to get more than her share of stroking and chat. The equine spirit is amazing. Ghost Dancer will be traveling with me to the Wild Horse Sanctuary in California. I'd never been part of ANY kind of auction, before (except fictional ones! ), let alone an EBay style Internet auction, but my friend Anne advised me to hang back. I made initial bids on Ghost Dancer and Shell Flower to make sure my computer worked on the Auction website, then waited 'til the last minutes of the auction to bid again. That doesn't mean I wasn't WATCHING from the minute my eyes opened Wednesday, and I noticed (so did lots of you!) that a Texas bidder -- if you're reading, wow, you have fast fingers! -- had replace me as high-bidder on both horses. My hands were shaking. My neck got stiff. I spoke harshly to Sherlock the cat when he sat on my lap and tapped the computer keyboard with a gentle gray paw. And I worried. It wasn't likely, but what if the other bidder had Bad Intentions? I decided I had to make GHOST DANCER my first priority. At fifteen years old, she was listed as a sale authority horse. BLM discourages bidders from selling such horses for "commercial purposes" but she could legally be headed for out-of-the-country slaughter as soon as she was in the wrong hands. 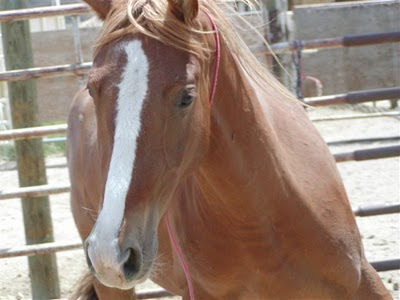 BLM, in theory at least, is supposed to keep an eye on adoption horses like SHELL for a year. But Ghost Dancer won't be traveling to California alone :) ! At the advice of a nice woman in BLM's Eastern States office, I picked a "safety net" horse. I narrowed my choices down to mares no one had bid on. Among them, I searched for one captured on the same day, in the same place as Ghost Dancer. I found her! Little sorrel #0795, is now named Sage. p.s. GHOST is 15 and SAGE is 2.
Who knows? They might even be mother and daughter. Visit, pick your favorite (price is no object), and let us know her/his tag number so that we can compare! GHOST DANCER has offered me her story to write. I'm offering her and her bff a place to run in a wild place, even if it isn't home. (under Authoring Change on TerriFarley.com home page) so that you can ride along and watch from a distance. I stumbled across the GoodReads website via a Google Alert on a page that mentioned my book SEVEN TEARS INTO THE SEA. That was cool, but even cooler was my exploration after that. It's a wonderful website that lets you talk to other people about books. You can start HERE like I did and then strike out on your own adventure. I just watched the movie UP on Friday night & I believe more than ever -- it's all about the adventure. A winter photo to cool you down & rev you up! These two guys drove hundreds of miles to make their statements about the treatment of wild horses. I get letters and emails from boys & guys sidling up to me at book signings -- mostly teens -- who are a little disgruntled because people think wild horse activism is just for girls. NO WAY, I tell them, and these two decided to show up and prove it. Ride along with me ? 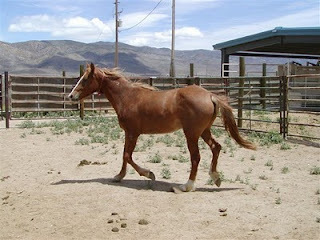 My application to bid on Calico Mountain horses during the Internet adoption has been approved! This is a bittersweet moment. Ghost Dancer and Shell Flower shouldn't have human names. They should be free. While freedom on their home range is out of reach, though, I'll bid on them, and if I'm successful, purchase their transportation to a sanctuary and sponsor them for their lifetimes. They'll have a website page for right away ; even if I'm unable to keep up with the bidding (they're glorious mares & I'm certainly not the only one who thinks so) the process will be interesting. This is a brand new experience for me, and I hope you'll ride along. Here, Wild Horse Sanctuary volunteers Sam & Chilly Pepper vist a Reno school. The California sanctuary has an internationally known internship program for college students. The Wild Horse Sanctuary in Shingletown, California HOME OF THE REAL PHANTOM will host its annual open house on AUGUST 21. Put it on your calendar now & I'll remind you later! There just might be additional special guests! The Tuscarora mustangs neighed, screamed,rumbled in strange lionlike roars I've never heard before -- for one hour and forty minutes. I don't know how long they'd been crying before we reached the Palomino Valley Wild Horse Adoption Center. I don't know if it's still going on now that I'm home. I do know it's legal and I could do nothing about those sounds, or the collisions of horseflesh and bones with something that sounded like thunder, on and on and on. Photographer Cat Kindsfather and I went to Palomino Valley to check on the captive Calico horses and to get a first look at the Tuscarora horses that Alan Shepherd had said, under oath last week, were available for public viewing. Sixteen mares and six foals were visible. We were not allowed to enter certain areas because other Tuscarora horses were being freeze branded ad processed. The sixteen mares and six foals called to those in distress. With foals tucked tight against their sides, mares patrolled back and forth in such tight formation, neither Cat nor I are positive of our counts. These horse are a few days off the range, bewildered and stunned. And this is legal. BLM is doing what it is allowed to do. I don't dispute that, but it is far from humane to confine wild animals who've spent their lives escaping predators and subdue them so that they can be attacked. An old boyfriend returned from war saying that he always heard distant gunfire. In the grocery store, in church, in his own bedroom at home, an endless tape of combat played in his mind. I hope he got over it. My ears ring with horses keening, men shouting and the thunder of bodies trying to batter their way to freedom. Here's a stark example of what's wrong with BLM's wild horse plan. Here's this old guy -- BLM doesn't note dehydration or starvation -- and he's doing okay out there on the range because he's a WILD HORSE. Wild horses don't depend on sight as we humans do. Smell and hearing are much more important. Besides, he had a lifetime of experience and his herd. Wild horses depend on each other to reinforce what they hear and smell and if they can't see, others can. This time, the old stud probably shouldn't have obeyed the shoulder bumps and snorts, but he did, following his herd when the helicopters came for them. I didn't see this old boy. Judging by BLM's press release, this stallion was destroyed because he didn't measure up to what BLM expected in a horse. And that's just plain sad. But I hope it will leave us, let us be free. Where is the grass I am used to? They are lost to me. I've asked myself this question dozens of times & now I need your opinions. 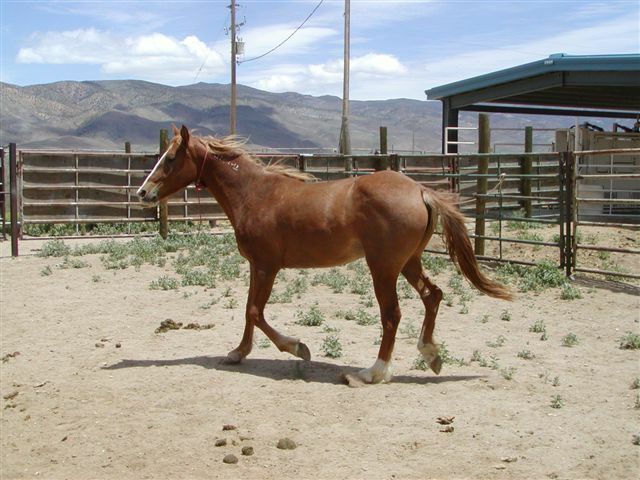 If you look here:Calico Mountain horses you'll see many up for Internet adoption. Look carefully, though, at the young gelding number 1143 and the mare I've been calling Ghost Dancer #0832. Here's the question: Don't they have amazingly similar conformation? You'll have to look at he full body photos to really see it. I'll have an update on the Tuscarora mustangs, soon. 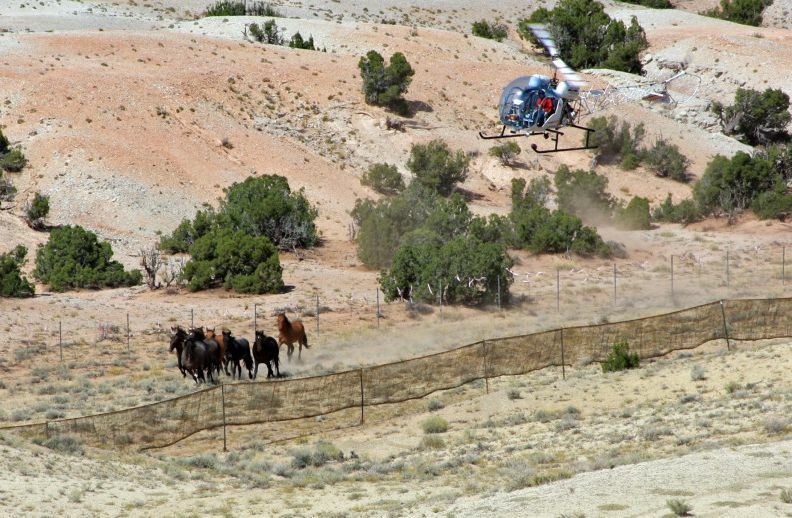 Short story: BLM got the go-ahead to round up the horses, but they have to let the press and public watch. As a plaintiff in the lawsuit to halt the BLM's deadly winter round-up of the Calico Mountain mustangs, I sat in Federal Court in Washington, D.C. and heard Judge Friedman recommend against the round-up. BLM did it anyway. There were no consequences. Reno NV (July 15, 2010)—The Cloud Foundation learned that United States District Judge Larry R. Hicks yesterday granted an immediate injunction preventing continuation of the Tuscarora Wild Horse Roundup in NE Nevada by the Bureau of Land Management (BLM) until further order of the court. Cloud Foundation Herd-Watch Program Coordinator Laura Leigh filed a Temporary Restraining Order (TRO) to halt the already fatal Tuscarora Roundup in Elko County Nevada on July 12. One dozen wild horses, including three foals, have died as a result of the BLM’s July 10 roundup of 228 animals staged on private land with public oversight prohibited. Originally BLM Director Bob Abbey suspended the roundup until July 18 but the court learned late yesterday that Abbey had authorized roundup crews to resume the removal operation eight hours before the scheduled hearing. Based on this change in BLM’s position, Judge Hicks granted Leigh the TRO. The hearing for Laura Leigh v. Ken Salazar (3:10-cv-00417-LRH-VPC) will be held Thursday, July 15 at the US District Court, 400 S. Virginia Street in Reno, beginning at 2:30 p.m.
A white stallion looks over his wild mustang mares on Bureau of Land Management land near Susanville. Despite the hot weather deaths of this weekend, BLM still plans to round up 6,000 wild horses by summer's end. The BLM said it plans to conduct the summertime "gather" of 2,300 horses and 280 burros from the Twin Peaks area in northern California (home to the small herd in the photo above) to avoid doing it later in the fall, when it would conflict with deer hunting season. Readers, I guess I'm getting suspicious and skeptical because I just bet the reason for this round-up will change before long. BLM will say they're "gathering" for the horses' own good, or range protection, just as the Tuscarora horses were dying of thirst this week. Last week the Tuscarora mustangs were being gathered for knocking down fences. BLM, here's a tip: TELL THE TRUTH AND YOU WON'T HAVE TO REMEMBER THE LIES. Last Thursday we talked about the callous & foolhardy nature of the Tuscarora roundup. Thousands of Americans begged BLM not to go forward with this plan. "The roundup was halted Sunday morning after four horses were found dead in the pens and several others showed signs of colic and brain swelling. Seven horses eventually died." BLM blames a pre-existing condition, but why didn't the horses DIE of dehydration until they were stampeded across the desert in searing heat, then slammed into pens? Oh, and that horse that had to be shot because of a broken bone? Shrug, who knows? If you can stand to read more, read the BLM press release below. Reno, Nev.–The Bureau of Land Management announced today that it is temporarily suspending the Tuscarora wild horse gather operations in Elko County, Nev., after BLM staff determined that gathered horses were dehydrated after seven gathered wild horses died from dehydration-related complications because of insufficient water in the area. The BLM also announced that the Tuscarora gather operations, aimed at removing horses from overpopulated herds, will remain on hold until an assessment has been completed to determine how to best proceed in light of the current condition of these horses. The Tuscarora wild horse gather encompasses the Owyhee, Rock Creek, and Little Humboldt Herd Management Areas (HMAs) located in northern Elko County . The BLM initiated gather operations in the northern portion of the Owyhee HMA at 6:30 a.m., Saturday, July 10. By 9 a.m., the BLM contractor had gathered 228 wild horses, consisting of one group of approximately 32 horses located within a mile of the on-site temporary holding corrals, and a second group of approximately 196 horses located about eight miles from the corrals. On arrival it was noted the horses were “drawn up,” or lacking fill from water. They were, however, generally in good body condition with most scoring 4 to 5 on what is known as the Henneke body condition scale. The horses were provided with hay and water through the afternoon and evening. One horse was euthanized shortly after being gathered due to a fractured leg that occurred in the temporary holding corrals. The morning of July 11, four horses were found dead in the pens and several horses were exhibiting signs of colic and brain swelling which was subsequently attributed to water starvation/dehydration and subsequent water intoxication. Gather operations were stopped at that point, and BLM staff, specialists, the gather contractor and the on-site U.S. Department of Agriculture veterinarian began treating the horses. So far, seven horses have died from complications related to water starvation/dehydration or subsequent water intoxication. It was determined this was a direct result of a lack of water in the immediate areas occupied by the horses. The BLM brought in extra water, tank trucks and troughs to the temporary holding site to ensure that all gathered animals have ample water available. Electrolytes were provided in each pen and affected animals were examined and treated as indicated by the veterinarian on site. The private contractor conducted an aerial flyover of the immediate area Sunday morning, July 11, and located two large bands of wild horses. One band, approximately 100 to 150 horses, is staying close to a nearly dried-up water hole. The second band, approximately 150 to 200 horses, is located approximately eight to 10 miles from the nearest water source. Both of these bands are presently at risk of mortality from dehydration if they do not reach other water sources. The BLM is unable to bring water into this area because the area where these bands are located is not readily accessible by road. The BLM will carefully monitor the two bands of horses during the next few days to determine whether they are independently moving to other water sources or can be encouraged to reach such waters on their own. The BLM will also continue to provide food, water and veterinary care for the animals in the on-site temporary holding corrals. Want to go on a quick Hawaiian vacation? and it returned me to the only polo match I've ever watched. ...the mingled scents of beach, flowers, smashed grass and horses! ...a big Tongan exercise girl -- over six feet tall -- with a thundercloud of black hair, who was an Amazon** queen in the saddle. The horses LOVED her! ** before Amazon became synonymous with online sales, AMAZONS were known in Greek mythology as a tribe of warrior women and Hippolyta was their queen. Her name means "freer of horses" ! Saturday 174 "privately owned" (ungentled, un-halter broken,looking a whole lot like mustangs) ranch horses were put up for sale at the Fallon Livestock Exchange where horses are often sold by the pound. You know what that means. 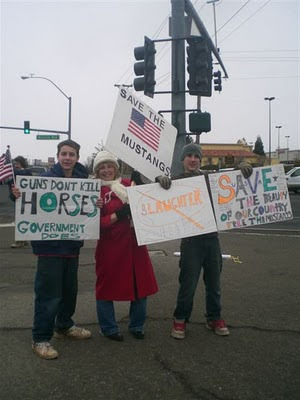 HOWEVER -- wild horses advocates wasted no time stirring up the media and contacting rescuers like Jill Starr's LIFESAVERS, WILD HORSE MENTORS, LET 'EM RUN FOUNDATION, WILD HORSE SPIRITS, the CLOUD FOUNDATION, and many others. With fingers crossed, funds raised, lots of hope, prayers and backbone -- horse advocates faced off with slaughter middle men and WON! INVESTIGATIONS INTO WHETHER THESE ARE WILD HORSES will continue. Soon I'll have the chance to bid on these two Calico gals -- in human terms I call them Ghost Dancer and Shell Flower -- and see that they're safe in a sanctuary until (fingers crossed) they can be returned to their home range. If you're thinking of bidding on either of them during BLM's Internet adoption, please get in touch so that we can chat! I will be out of computer range until Sunday, but I'd love to hear from you. BLM Helicopter Roundup To Begin Tomorrow? If the Tuscarora round-up of 1,400 mustangs begins tomorrow, BLM will be violating their own rules that protect wild horse foals! BLM's 2010 Handbook states that BLM MUST WAIT SIX WEEKS AFTER THE END OF FOALING SEASON to avoid hot weather danger to babies. BLM defines foaling season as March 1-June 30. They're starting more than a month early! “If allowed to go forward this will be a massacre,” says Anne-Marie Pinter. She rode the Pony Express route through the area on her Spanish Mustang and reports, "...our event veterinarian strongly recommended that we put thick rubber boots over the metal shoes of our horses." Readers, I've ridden this terrain. It can be treacherous at a measured walk. How coordinated and careful would you be if you were running for your life, fleeing a loud, lowering monster? Rememer the foals whose hooves were literally run off during the snow and ice Calico round-up? Remember BLM's statement,then, that winter round-ups were so much better than summer ones? So, Summer round-ups are dangerous. Unless, you know, BLM changes it's agengy opion. And numbers. Curious about the "need" to round up 1,400 wild horses? BLM claims they knocked down some livestock fences. 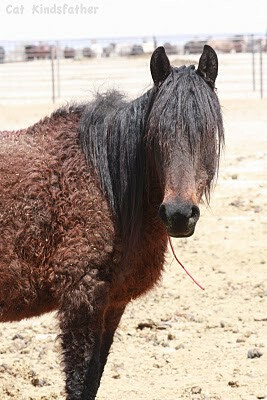 Many Calico mustangs died even when humane observers stood alert with cameras during the winter round-up. For the Tuscarora round-up, NO HUMANE OBSERVERS WILL BE ALLOWED. What does BLM have planned that necessitates LOCKING OUT THE PUBLIC from the range as well as the AIR SPACE except for a single media day? Call NEVADA Senator Harry Reid's Washington, D.C. office FRIDAY MORNING and ask him to stop the Tuscarora (pronounced TUSK UH ROAR UH) Round-up. If you'd like to offer a solution, ask that all wild horse round-ups be halted until BLM can be investigated by an INDEPENDENT agency. Nervous about calling? Ask yourself what you stand for, then start dialing! The first few emails I read this morning have made me feel like I'm on a roller coaster. Emmy award winning TV reporter George Knapp has uncovered information that BP --yes, the same British Petroleum which is ruining the Gulf of Mexico and the beaches of many Southern states, is working with BLM to remove wild horses from oil-rich areas. I think I already told you that Undersecretary of the Interior Sylvia Baca has worked in high level positions for British Petroleum over the past decade. The good words came from a reader who works for an equine rescue. When I told her I planned to take a closer look at 175 unbroken horses offered in a special sale at a nearby livestock auction, she said: Just remember that given the chance they would do anything for you not because they have to but because they want to. Appreciate, love and be faithful to what we have, but NEVER stop making it better! Last chance to sign up for my free e-newsletter before the July issue comes out. It has some wonderful photos and a newsletter-only contest announcement which ends at midnight July 4th! The BLM is on the rampage this summer – removing 10,000 more wild mustangs from OUR public range – perhaps more than ½ of America’s wild horses. 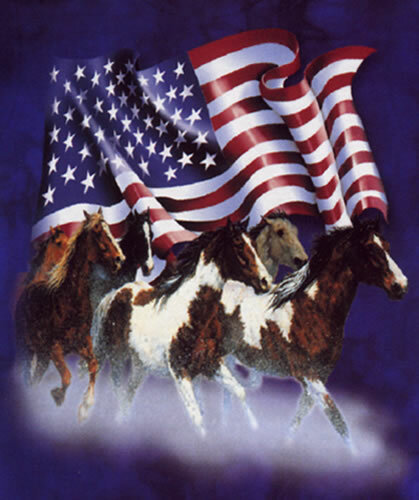 We invite you, and anyone you know with a love of horses, to join us on July 4th to drive the Las Vegas strip in our vans, trucks, cars and horse trailers decorated with gorgeous wild horse banners and red/white/blue flags to let America know that we are in imminent danger of losing our wild mustang heritage! To Better Serve You: KEEP OUT! BLM is locking up 27,000 Nevada acres of public land from July 6 - 31, "to help ensure the safety of the public, contractors and government employees, and wild horses" as they strip the range of all but a handful of mustangs. Your lands and your horses will be off limits, but don't worry, BLM says you'll "have the opportunity to attend the gather on specifically scheduled and escorted visitation days." Semantics note: replace "opportunity" with RIGHT, that's what makes those thousands of acres public lands.